Early in the morning of September 12 the Dark Energy Camera (DECam), mounted on the Victor Blanco Telescope at the Cerro Tololo Inter-American Observatory in Chile, recorded its first images of a southern sky spangled with galaxies. Galaxies up to eight billion light years away were captured on DECam's focal plane, whose imager consists of 62 charge-coupled devices (CCDs) invented and developed by engineers and physicists at the U.S. Department of Energy's Lawrence Berkeley National Laboratory (Berkeley Lab). Berkeley Lab CCDs are noted for their exceptionally high sensitivity to light (quantum efficiency), particularly in the red and infrared regions of the spectrum – a crucial advantage for astronomical CCDs searching for objects at extremely high redshifts. Combining the 570-million-pixel focal plane made of Berkeley Lab CCDs with the light-gathering power of the Blanco telescope's 4-meter mirror, DECam has unique ability to reach wide and deep into the night sky. 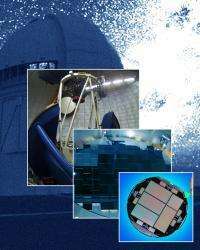 DECam was built by the Dark Energy Survey (DES) collaboration based at the Fermi National Accelerator Laboratory. 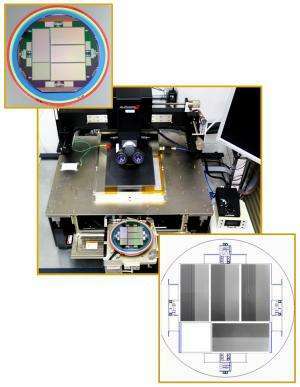 A photometric imaging camera, it measures the amount of light in various colors from astronomical objects rather than details of their spectra. DECAM's goal is to measure the expansion history of the universe by collecting images of 4,000 distant supernovae and 300 million distant galaxies within the next five years. "Early in the planning of DECam, Fermilab realized that the high-redshift galaxies they sought would require longer exposures to get secure photometric results, and that the Berkeley Lab CCD's higher quantum efficiency in the near infrared would make the survey much faster and more efficient," says Natalie Roe, Director of Berkeley Lab's Physics Division and, in the early 2000s, the leader of the Lab's CCD Group. When DECam began construction, Roe worked closely with Peoples, DECam project manager Brenna Flaugher, Juan Estrada, Tom Diehl, and others in the Dark Energy Survey collaboration based at Fermilab. Manufacture of the DECam CCDs was overseen by Steve Holland, a senior engineer in Berkeley Lab's Engineering Division, who invented the Berkeley Lab CCD in the mid-1990s as a spin-off from research and development of detectors for high-energy physics. Most astronomical CCDs at the time were fragile affairs because, to be sensitive to faint light, they had to be thinned to about 20 micrometers (millionths of a meter), a fraction of the roughly 100-micrometer width of a human hair. Berkeley Lab CCDs are beefy by contrast – the DECam CCDs measuring a robust 250 micrometers thick – yet they maintain high resolution across the spectrum, including in blue light. When photons hit the back surface of the chip, the holes they create (the positively charged equivalents of electrons) are pulled through to the circuitry on the front by an electric field generated by a bias voltage, which permeates the entire thickness of the CCD. In red light, with more material to capture long-wavelength red photons and enough thickness to suppress surface reflections that cause interference fringes, Berkeley Lab CCDs are far superior to the typical astronomical CCD. Fabrication methods for ultrapure silicon originally developed for high-energy physics insure that the Berkeley Lab CCD's "dark current" – charges originating inside the chip, a source of false signals – is also low. "Fermilab was attracted to our CCDs because of their improved red response," says Holland, "but considering that there were as yet no big cameras using them when DECam was planned, they had to decide to take a risk." The DECam chips were fabricated by Berkeley Lab's industrial partner, Teledyne DALSA Semiconductor, and the Physics Division's MicroSystems Laboratory. Partially finished wafers holding four CCDs, each with eight of eleven masking steps completed, were commercially thinned, then sent to the MicroSystems Laboratory for completion. "Cold-probe" tests at minus 45 degrees Celsius were performed to detect shorts, defects, and excessive dark current. The CCDs were cut from the wafer and sent to Fermilab for mounting and final testing of the science-grade devices. "In the first months, manufacturing went slowly," Roe says, "but we used data from each lot of wafers to feed back processing improvements, and the yield steadily improved. We used conservative estimates and overshot the requirements – at the end, we produced twice as many science-grade CCDs as needed." Because collaboration between Fermilab and Berkeley Lab on DECam began early in the large-scale development of the Berkeley Lab CCD, the experience benefited both parties. DECam will produce the largest-ever 3-D map of the universe, a record currently held by the third Sloan Digital Sky Survey and its largest component, the Baryon Oscillation Spectroscopic Survey (BOSS), led by Berkeley Lab astrophysicists. The red channel of the SDSS-III spectrograph, whose development was led by Roe, also uses Berkeley Lab CCDs. Says Holland, "We could not have made the BOSS CCDs, which are twice the size of the DECam CCDs, without learning what we did in ramping up for DECam." Roe adds, "Delivery of CCDs has often ended up being the bottleneck for astronomical instrumentation, but in this case we delivered on time and things came together as planned. It was an example of great teamwork between Berkeley Lab and Fermilab." Another example of our tax-payer dollars, multiplied by industrial partners at work. Frankly, this article makes paying taxes just a little bit easier.